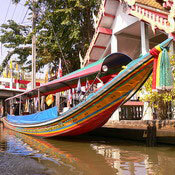 Taling Chan Floating Market is located on the Chak Phra Canal and is only open on the weekends. Orchard produce, vegetables and fish are sold from boats. There is a live traditional Thai music performance over lunch time, but the main attraction of the market seems to be the floating restaurants. Taling Chan Floating Market is the only floating market in the Bangkok city area and is on a canal linking the Bangkok Noi canal to the north with the Bangkok Yai to the south. 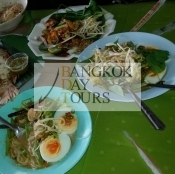 It is located across the Chao Phraya River in Thonburi and the best way to get there is to take a boat tour through the Thonburi Canals. The boat will stop here for an hour or so, giving you time to wander through the market & to taste the culinary delights. 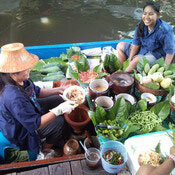 Moored alongside the main platform are a number of boats where vendors cook up a variety of mouth watering dishes. 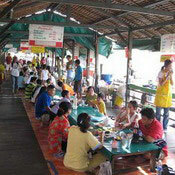 The floating restaurant has groups of low tables and you sit on the floor to eat. 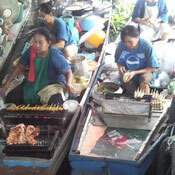 The food is cooked for you on the smaller boats. One recommended item is the "Boat Noodles". It is a famous Thai dish, not only for its excellent taste but also for the scrumptiousness of a seasoning called "chilli", which is commonly used in every Thai household. 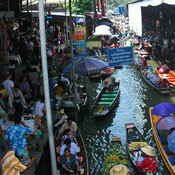 The Taling Chan Floating Market was initiated by Chamlong Srimuang in 1987 to honor King Bhumibol's 60th birthday.